Many people have heard of Harry Potter and his many adventures in the seven books and eight movies written and guided by J.K. Rowling. Not as many know that there is an 8th adventure currently playing on Broadway and in London called "Harry Potter and the Cursed Child: Parts 1 and 2." 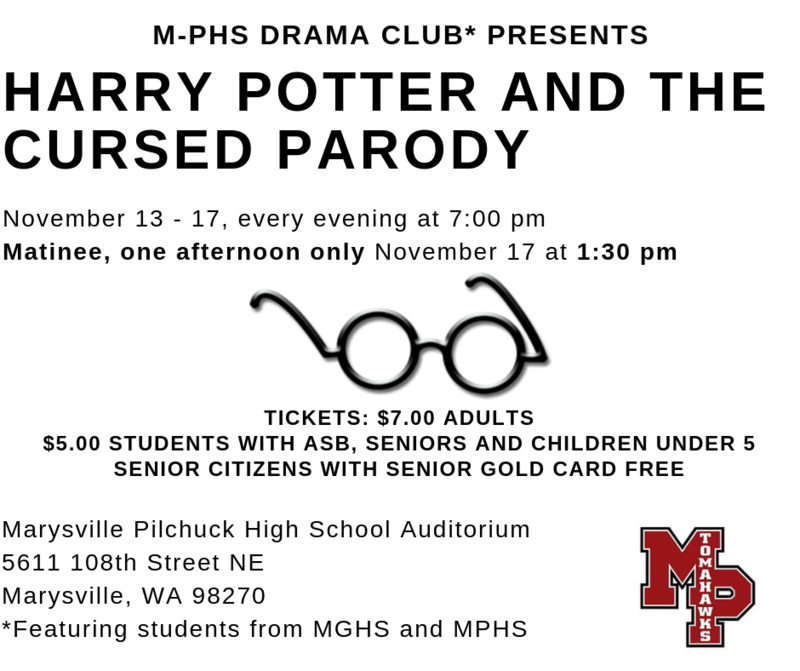 M-PHS Drama Club recognizes the fact that flying to New York or London is expensive and even more expensive are tickets to see this show, that's why they decided to bring the show to Marysville. Unfortunately, since it's a new play, M-P Drama couldn't secure the rights or have the money to perform the $68 million 5 + hour play on the M-P stage. So M-P Drama did the next best thing and created a parody version. The parody follows the characters and plot of the 8th Adventure...but not exactly. This version picks up at the end of the seventh book/eighth movie and focuses on Harry Potter and Draco Malfoy's sons and the troubles they face when they mess with time travel. It's "Back to the Future" meets "Dr Who" meets "Dracula" meets "Hamilton" in the Harry Potter 'Wizarding' World. The show runs about 90 minutes now and cost about $67,999,000 less to produce. M-P Drama spared every expense, but you'll see how creative they can be with a small budget! They play stars students from both MPHS and MGHS and will be presented November 13 - 17 at 7:00 pm with a special matinee performance on the 17th at 1:30 pm. Admission is $7.00 for adults and $5.00 for students with ASB, Senior Citizens and children under 5. Senior Citizens who present their MSD Gold Card get in free. It should be a fun show for muggles of all ages! For more information, email Roy Klementsen @ roy_klementensen@msd25.org.